LOS ANGELES (May 26, 2015) – World famous Kpop band and fashion icons, BIGBANG, announced today they will hit North American shores in October with their highly-acclaimed 2015 WORLD TOUR ‘MADE’. Presented by YG Entertainment and Promoted by Live Nation, the tour will kick off on October 2 in Las Vegas with tickets going on sale Friday, June 12 at 10:00 a.m. EDT on www.LiveNation.com, www.Ticketmaster.com and through the Live Nation mobile app. A complete list of tour dates is below. Their first successful world tour “BIGBANG ALIVE 2012” attracted over 800,000 fans taking in 24 cities and 12 countries through 49 incredible shows. After a three year hiatus, BIGBANG’s comeback with the current world tour and brand new music is creating a buzz among fans all over the world. BIGBANG is on track to break records on their current ‘MADE’ tour which has already sold out multiple dates across Asia, with more dates across the globe to be announced soon. YG Entertainment also confirmed that BIGBANG will release new music on the 1st of every month between May and September. The band performed two new hit singles, Bae Bae and Loser, at their sold out shows in Seoul the 25-26 April. Bae Bae and Loser have garnered a phenomenal following having won multiple awards and continue to rule the charts; the music video for Loser has surpassed 20 million views on YouTube. 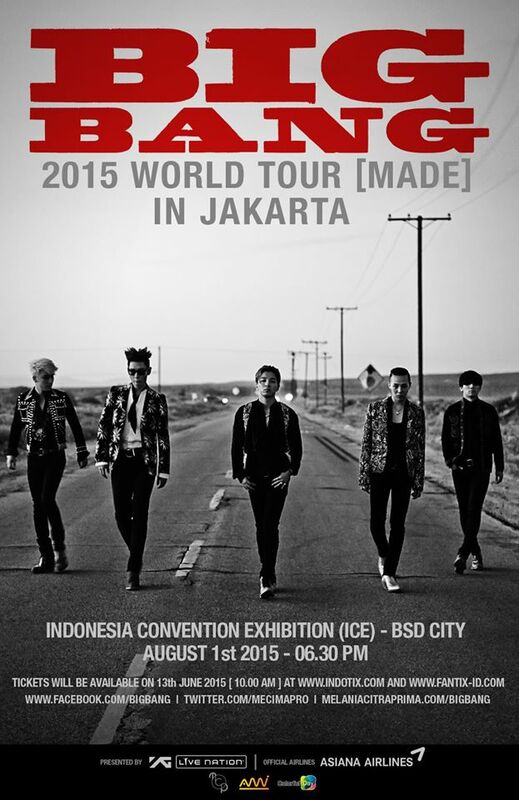 The excitement continues to grow about BIGBANG’s performance of new singles at upcoming shows of the tour. On June 1, the band will release another new song and the full album, MADE, will be released on 1 September. BIGBANG, formed by YG Entertainment, is the hottest Korean artist group consisting of G-Dragon, T.O.P, Taeyang, Daesung, and Seungri. Since their debut in 2006, BIGBANG has evolved and become known not only for their unique music style but also for their flamboyant fashion sense making them widely worshipped across the globe by world-renowned artists, music lovers and fashionistas alike. Their official YouTube channel has accumulated over 1.2 billion views, among which their hottest hits “Fantastic Baby”, “Blue” and “Bad Boy” have accounted for more than 250 million views. 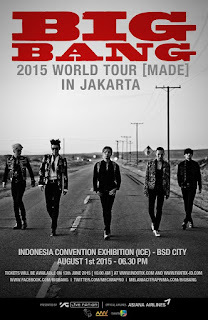 For additional information, visit: www.facebook.com/bigbang.